Gionee P7, the entry-level smartphone from the Chinese brand is receiving a new software update. The latest update brings a host of new features including the ViLTE (Video over LTE) feature. The ViLTE features allow you to make video calls on the 4G network without any lag. Gionee has posted the details about the update on its official Indian website. Besides the ViLTE feature, the upgrade also comes with new features. With the new update, the Gionee P7 joins the festivities during the holy month of Ramzan by adding the Urdu language. It also brings the BeautyPlus application- a popular selfie clicking application in Google Play Store. Gionee says that the feature will allow the users to enhance the selfies. And this feature is aimed at selfie lovers in the country. The update adds a new suspend button feature with which users can save more time and energy simultaneously because it lets you to quickly access essential functions such as locking your screen, as well as opening your favourite apps, all with a gentle tap on the screen. The suspend functionality is present in the notification bar. Gionee has also updated the Mood Wallpapers, Theme Parks, and improved GStore apps in the P7. The Mood Wallpapers will change your wallpaper automatically. The Theme Park now has more functionalities, and the company says that the GStore will further enhance the user experience. Some of the system apps such as UC Browser, Xender, Saavn, True Caller are updated to the latest versions. Lastly, the update includes the latest Google Security Patch fixes coming from Google. The Chinese vendor claims that the inclusion of the most recent security patch will ramp up the protection of the phone, ensuring the device to be secured all the time. The update is already rolling out to the users of Gionee P7 smartphone. The device is currently selling via Flipkart for around Rs. 9,000. Do you have a Gionee P7 smartphone? If yes, let us know the improvements in the phone after updating the device to the latest version by commenting below. No it’s ViLTE (Video over LTE). 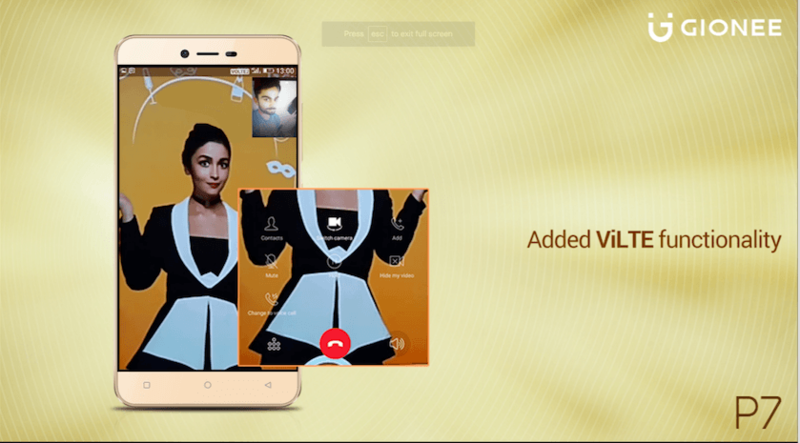 Gionee has updated all its 4G phones that support VoLTE to also support Video calls over LTE. Many of the Chinese phones still do not support video calling over LTE. Many of the OPPO and Vivo phones do not…..and those are the hot sellers right now. Not sure about Nubia and Honor, please update me on that. I’m pretty sure I did see LTE+ on my HTC Desire 10 Pro while roaming in Mumbai. VoLTE is Voice over LTE which refers to voice calling on LTE network, ViLTE is Video over LTE which refers to native Video calling without need of apps like Skype, whatsapp, Duo, etc. Even if it support video over LTE it will still be voLTE. Abbreviations won’t change. Or I think it would. Article is written by raw student.